Remington Golden Bullet 22 Short Ammo High Velocity 29 Grain Round Nose ammo for sale online at cheap discount prices with free shipping available on bulk 22 Short ammunition only at our online store TargetSportsUSA.com. Target Sports USA carries the entire line of Remington ammunition for sale online with free shipping on bulk ammo including this Remington Golden Bullet 22 Short High Velocity Ammo 29 Grain Round Nose. Remington Golden Bullet 22 Short Ammo High Velocity 29 Grain Round Nose ammo review offers the following information; Remington is one of the leaders in rimfire ammunition advancements! Remington offers the perfect 22 rimfire ammo for any occasion, including this Remington 22 Short High Velocity cartridge! The Remington 22 Short ammunition is ideal for competition, plinking, target shooting, and small game or varmint hunting. This 22 Short High Velocity ammo features a 29 grain Round Nose bullet. Remington 22 Short is non-corrosive, new production ammunition, featuring brass cases and boxer primer. Remington rimfire ammunition provides high quality shooters have come to expect! Remington puts the same level of care into making their rimfire ammunition as they do their centerfire ammo, so shooters get the maximum performance out of them! 22 Short from Remington Golden Bullet offers a muzzle velocity of 1095 feet per second and a muzzle energy of 77 ft lbs. 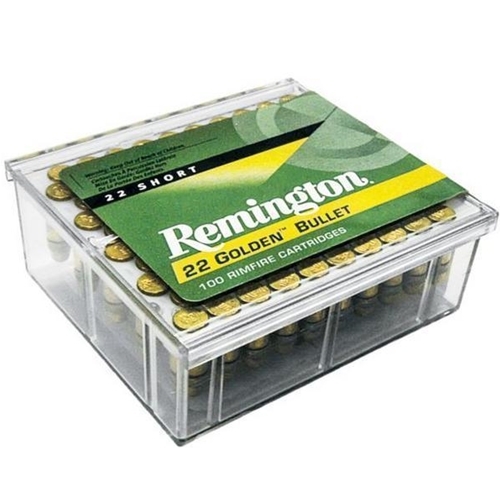 Remington 22 Short High Velocity ammo is packaged in a box of 100 rounds or a case of 5000 rounds. Free shipping is available on bulk case orders of this Golden Bullet 22 Short ammo from Target Sports USA. Remington has been a trusted brand for years when it comes to the production of good quality bullets at economical prices. Remington ammo is produced mostly for those shooters looking to go hunting. With the perfect ammo bullets for each caliber of centerfire rifles, rimfire, shotguns, UMC, and pistols and revolvers. Muzzle Energy 77 ft. lbs. Remington is by far the superior brand! Target Sports USA had what I wanted and I bought it , They will be on My ammo list when I need to Restock ammunition. Thank You Target Sports USA.